"The images are either all points, or fluffs, and the fluffs are these giant million-light-year balls of hot gas that we call clusters, and the points are black holes that are accreting gas and glowing as this gas spirals in," McDonald says. "This idea that you could have a rapidly accreting black hole at the center of a cluster—we didn't think that was something that happened in nature." energy output from black holes," says Brian McNamara, professor of physics and astronomy at the University of Waterloo, who was not involved in the research. "This particular object is interesting because it bucks the trend. Either the central supermassive black hole's mass is much lower than expected, or the structure of the accretion flow is abnormal. The oddballs are the ones that teach us the most." Preconception of any object at such a far distance most often requires a full review and recall of erroneous information to the general public, which includes most science websites. It is unpredictable the amount of confusion and mistrust such poor preconceived information could cause to young scholars who have placed their trust in scientists/researchers to provide absolutely good data. Incalculable harm could result to students whose career goals are in STEM when, after having read the original data, they ultimately find that the researchers essentially were primarily "going by feel" rather than seeking the truth in their methods and theory. "This might be a short-lived phase that clusters go through, where the central black hole has a quick meal, gets bright, and then fades away again,"
Said the confused merger maniac, wistfully. "The brightness of the black hole might be related to how much it's eating," McDonald says. "This is thousands of times brighter than a typical black hole at the center of a cluster, so it's very extreme in its feeding. We have no idea how long this has been going on or will continue to go on. Indeed, you have no idea (period). The extreme quasar is the primary source for the cluster itself, ejecting newly formed matter therefrom at a prodigious rate. There is no way accretion can supply the needed material to fuel this monster. The new material is born from within, in a process merger maniacs simply cannot comprehend. Instead, they ignore logical deduction born from numerous observation, and cling to their fanciful assumptions. Otherwise, they will loose their careers. 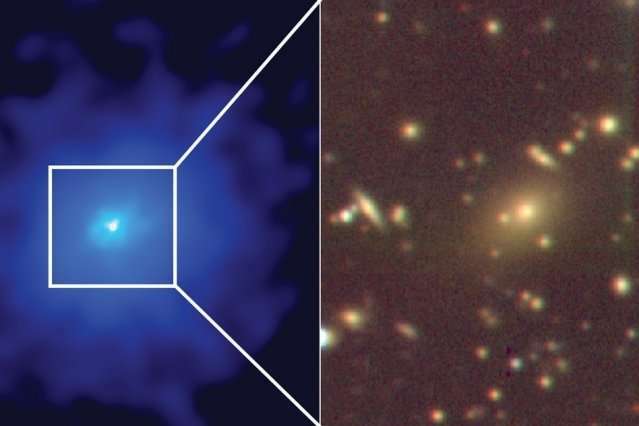 ...—so bright that for decades astronomers observing it in the night sky have assumed that the quasar was quite alone in its corner of the universe, shining out as a solitary light source from the center of a single galaxy. - quasars from 2.4 billion lightyears (to observational horizon) may also be associated with hundreds of galaxies around it like the one just now discovered above. - this plus other findings of humongous amounts of ORDINARY mass previously unsuspected/unseen (ie 'dark') makes naive/simplistic 'EXOTIC' DM assumptions unnecessary. ......but you must be wrong about this. Pop-Cosmologists have already explained they knew about this missing VM even before they found it, that it had already been accounted for in the total mass of the Universe when they were doing TOTAL GRAVITY calculations. Of course it has never been clear to rational thinking people how it can be known something is missing if you never knew existed in the first place, but that's Pop-Cosmology, never a cogent premise for their theories. The gravitational redshift caused by even the largest galaxy clusters is insignificant. It is only in radiation originating in the depths of potential wells such as a black hole that it becomes significant. Your comment shows that you have no understanding of the actual numbers. this plus other findings of humongous amounts of ORDINARY mass previously unsuspected/unseen (ie 'dark') makes naive/simplistic 'EXOTIC' DM assumptions unnecessary. This AGAIN shows that you do not understand the science. The discovery of new clusters does NOT reduce the need for dark matter. ALL clusters contain the same, or even greater, DM fraction as the rest of the universe. Despite your repeated claim (over many years) that the mainstream is coming around to your view, there are NO mainstream papers that support it. I defy you to actually produce one! .......you actually mean NO Pop-Cosmology papers to support it. It has never been clear to rational thinking people how it can be known something is missing if you never knew it existed in the first place, but that's Pop-Cosmology, never a cogent premise for their theories from which you make up your own CONCLUSIONS from FACTS that never existed in the first place. So, can you provide a SINGLE reputable paper that supports RealityCheck's claim, or are you expecting us to believe you and RealityCheck over EVERYTHING in the literature? Sure I can mister freelance journalist, and you can read it without having to bother with clicking a link to a different site........just go to the top of this page & read this article, then go on to complain that it isn't credible evidence. Or is your problem the fact that the EVIDENCE is so clearly in the OPEN that there must be another explanation? Hey, I'll bet you think that QUARKS have been isolated in the Hadron Collider and thus proven to exist? Let's just see if you find a way to say YES to this trick question. I have already pointed out that finding more clusters containing dark matter, does not mean that there is any less need for it to explain the observations. OK. What are the observations of b quark discussed in this page from the LHC website talking about ( https://home.cern...nts/lhcb )? The Standard Model does NOT result in logical analyses of spin 3/2 quarks. You do believe in the the SM do you not? Maybe just SORT OF is that it? What more could be expected of a freelance journalist who never saw a Differential Equation he could solve. Your response has become so hysterical that it lacks a single element of either relevance or truth! I really don't have any motivation for trying to hold a conversation with a RAVING lunatic. .............we know Rguy, it's hard competing inside the arena of REAL SCIENCE when all your fall back positions have no basis in reality. The gravitational redshift caused by even the largest galaxy clusters is insignificant. It is only in radiation originating in the depths of potential wells such as a black hole that it becomes significant. The discovery of new clusters does NOT reduce the need for dark matter. ALL clusters contain the same, or even greater, DM fraction as the rest of the universe. ......but the Pop-Cosmology crowd living here does'nt like things that are in plain sight, they gotta be hidden so as to prevent a rational mathematical extrapolation that would disprove the psycho-babble of their most precious fantasies, you know, things like neutron half-life. where this matter is also inertial mass where its gravity over the untold billions of light years gravitaionly redshifts or blue shifts photons for us to interpet. "Due to a phenomenon known as color confinement, quarks are never directly observed or found in isolation; they can be found only within hadrons, which exist as either baryons (which include protons and neutrons) or as mesons. For this reason, much of what is known about quarks has been drawn from observations of hadrons https://en.wikipe...ki/Quark "
With every post you display more ignorance. It is only in radiation originating in the depths of potential wells such as a black hole that it becomes significant. What do you think resides in those hundreds of previously unsuspected galaxies, RNP? There is no significant radiation from regions close enough to a BH for gravitational redshift to be significant in what we see (and before you fall into the obvious trap, the accretion is disk if FAR to distant for it to be a significant effect there). TRY to understand the maths! All of this ordinary matter is accompanied by the appropriate amount of dark matter, leaving the overall DM fraction unchanged. So, these discoveries have NO impact with respect to DM . Having that degree you've got in journalism does not entitle you to impose YOUR FACTS on other people who are far better educated than your mediocre level of Pop-Cosmology. That aside RNP because in reality it's not your fault as you're not his keeper. Concerning Gravitationally Induced Redshift, the frequency shift however slight is shifted every time a photon is near or grazing a star - the effect is cumulative from star to star on its journey to earth! This is why you appear to be correct RNP, because as you quote the text book, the book only discuss's the isolated incidents because that is all that is necessary for the purpose of educating as it is taking for granted the cumulative effect as general knowledge RNP. See what I mean concerning your logical friends logic rubbing off on you -- it is already taking place without you noticing RNP! And all that other 'gravitating stuff' previously missed, which makes up the bulk of the galactic and surrounding matter distribution in that region, including the widely distributed stellar-mass Bhs and NSs not yet (then) assimilated into the galactic nuclei supermassive BHs. You claim all that stuff NOW found has "insignificant" redshifting potential for photons generated from there and traveling for long distances through/out of, and affected by, all those individual gravity wells, polar jets, solar/galactic winds; not to mention the innumerable 'downshifting' effects from scattering processes from interacting with all that ordinary previously 'dark' matter everywhere? not to mention the innumerable 'downshifting' effects from scattering processes from interacting with all that ordinary previously 'dark' matter everywhere? A new article should be hitting here in a few hours. It concerns the New Horizons spacecraft discoveries at the edge of the solar system where the Sun's radiation & solar wind effects stop. What the spacecraft's instruments has picked up exactly at this point is akin to a wall of hydrogen & other very small particulate material that is unable to enter the solar system due to the outgoing effects of the Sun's distribution of energy that pushes this material away preventing it from entering. Yeah, lots of "missed gravitating stuff". OMG Benni, if only you understood the basics of GR you would not say such stoopid things. "missing gravitating stuff", ha, ha, you just don't get it, do you. Could you please explain why the missing "dark matter" cannot possibly be ordinary baryonic matter that has not been found yet? Can you? I bet you cannot! Excuse me, Ojorf, but Benni said "missED" not "MissING" in that post; he is implying matter previously unseen/uncounted in mass estimates, that's all. ps: I'm heartened to see someone else paying attention to the evolving likelyhood that DM was/is ordinary, baryonic etc (as increasingly being found). RealityCheck> Excuse me, Ojorf, but Benni said "missED" not "MissING" in that post; he is implying matter previously unseen/uncounted in mass estimates, that's all. You are no better than granville. I take it this "REAL SCIENCE" is only your non-evidenced-based pseudoscientific opinions that have never successfully passed peer preview because certain smart people (scientists) who are smarter than you or me and know much we don't will take one look at your asserted opinions and laugh their heads off because its all delusional ignorant nonsense. If it is really true that you actually believe all these reputable and extremely intelligent scientists are "gradually coming around to your opinion" then your also have mega delusions of granular; They never will. Why do you think they have so far not shown any sign of doing so? No, no, excuse me. You missed the point. Benni thinks the observed effects attributed to DM is actually baryonic matter that has been missed by science, or missing baryonic matter. See? When Benni talks about "real science" or "relativity" etc. He does not mean SCIENCE or Einstein's version of relativity, but rather some incoherent imaginary concept he dreamed up, not the real thing at all. It's fun to watch him blundering about, but unable to answer even the simplest of questions when pressed. Ojorf really, any question when asked, as you quite rightly know can easily be answered because yourself and all your logical friends just do what we are presently doing; we open another web page, do we not Ojorf. Maybe you haven't done much reading lately, your favorite Cosmic Fairy Dust has taken so many steps backwards lately for lack of evidence of it's existence. Pretty soon you're gonna be down to looking in a mirror sideways for discovery of anything resembling missing matter, and won't you be surprised to find the scale wasn't out of calibration. ......yep, that's often the heart & soul of the Pop-Cosmology crowd living here, here a twist, there a twist, everywhere a twist & before they can do yet another twist their words have already been reduced to unintelligible psycho-babble the shape of a pretzel. Oh, well, Ojo needs something to do. So anyway, Ojorf, you now seem to be agreeing with what I have been observing for some time now, ie, that the DM (previously unseen) matter is ORDINARY stuff increasingly being found everywhere we look now (ie, it's not 'exotic' and allegedly interacting 'only via gravitation' as hypothesized for some time now)?